Karsol, also known as Mountain Elves, live deep within vast mountain ranges and atop high foothills. The largest concentrations are in the Spine, the Heman Dal, the Tunderpeaks and the Calemil Mountains. Karsol look much like the humans of the land in which they live, with a slight grey sheen to their skin, usually one must see the pointed ears to tell them apart from nomadic humans. 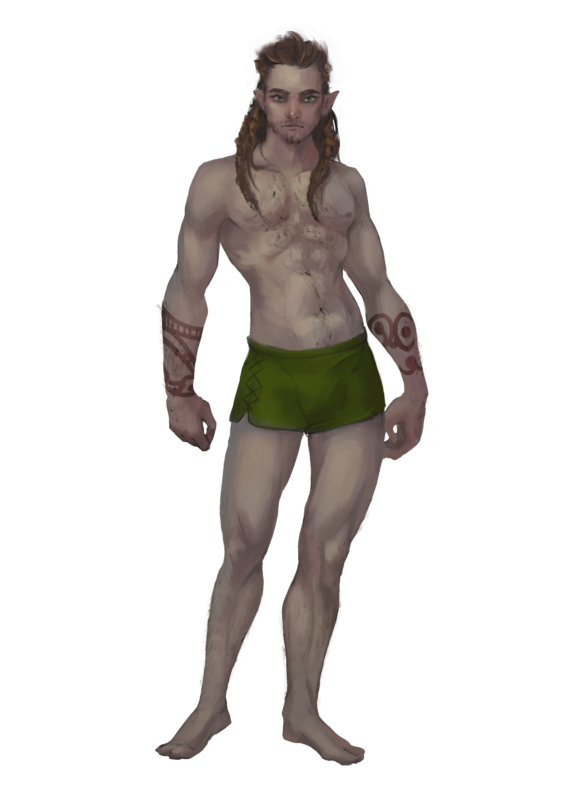 Karsol are the only Elven race, besides possibly a Halfblood, that have facial hair. Karsol favor earth tones for clothing and often decorate their skin with tattoos. Karsol get along with Mountain and Hill Dwarves and sometimes integrate civilizations with those races. They do not care for lowlanders much, seeing other elves and humans as being below them quite literally. Karsol lean to the lawful aspect of ethics, living in well constructed stone cities and fortresses. Karsol care less about good or evil, they care about themselves and their kind, and all others second. Abilities: +2 Str, +2 Con, -2 Dex, -2 Wis: Karsol, like the mountains they live in, are rather strong. However they are also a little slower and less keen to their surroundings due to their lumbering size. Medium: Karsol are medium creatures and have no bonus or penalty due to their size. Normal Speed: Karsol have a base land speed of 30 feet. Immune to sleep effects: Karsol require the same amount of rest as elves as described in the core rule book and are likewise immune to magical sleep effects. Lesser Darkvision: Karsol can see in the dark up to 30 feet, this otherwise functions as darkvision. Grey Sheen (Ex): While underground within a cavern, ruins and/or mountainous terrain Karsol gain a +4 racial bonus to stealth checks due to the grey sheen of their skin. A DM may apply this bonus under any other similar condition, for example; a DM may award a +4 stealth bonus to a Karsol if they are trying to stealthily skirt around a city wall made of stone. A Karsol that passes by a secret or concealed portal that is hidden in or behind stone is entitled to a free perception check as though they were actively searching for it. Damage Reduction 1/-: Karsol are built sturdier than most folk, and can shrug off punishment. This damage reduction does not stack with any damage reduction later gained through items or class abilities, other than the Barbarians damage reduction. This damage reduction increases to 2/- at 10th level. Naturally Productive (Ex): Living in the mountains forces Karsol to adapt skills at an early age in order to contribute to society. Karsol begin play with 1 rank in craft.